The book is available in printed form or as a PDF file directly from the publisher and soon will be available from European retailers. 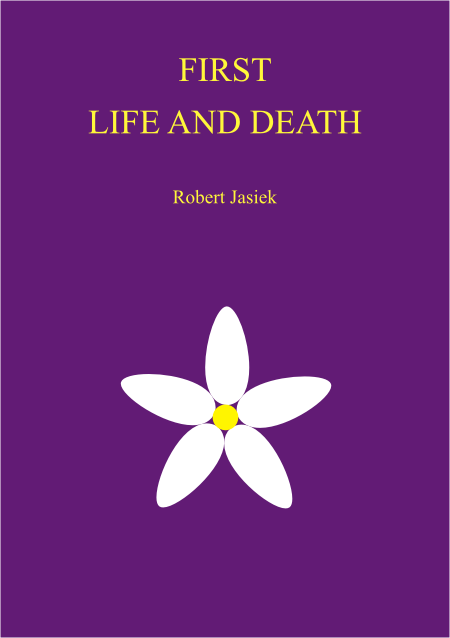 The author and publisher of First Life and Death is Robert Jasiek. The book is of A5 size, has 232 pages, has 9 diagrams per page on average, and has the suggested price EUR 25 (printed book) or EUR 12.50 (PDF file). On the one hand, the English literature has had first introductions to the game for newbies - on the other hand, there have been the following 'life and death' books for kyus: Life and Death Problems 1 - Basics has theory for all kyus but a too small percentage of the problems are for double digit kyus. Get Strong at Life and Death and Life and Death (Davies) have some contents for double digit kyus, other contents suitable only for single digit kyus but lack some essential contents for double digit kyus. In other words, a 'life and death' book specifically written for double digit kyus (EGF) and describing every essential aspect of theory has been missing. First Life and Death fills this gap in the literature by explaining everything a beginner needs to know about 'life and death' but omitting advanced topics relevant only for strong players. First Life and Death consists of two major parts: the theory part (96 pages) and the problems part (128 pages). Besides there is an index. The 17 chapters of the theory part explain life and death from scratch proceeding to increasingly demanding topics. Every chapter starts with theory explained by clear and general principles, examples, and (where necessary) terms, and concludes with a few easy problems and their answers so that the reader can check his understanding of the theory. The first few chapters about establishing independent life, removal of dead stones, recognizing nakade, seki and sacrifice allow beginners of 'life and death' study to follow the later chapters well. Everybody with at least some prior on-topic knowledge can skip the initial pages. Although there is nothing difficult about the topics in the next chapters about removing dead groups with kos, unsettled groups, and how to approach and count liberties of eyes, there are even dans with related knowledge gaps. Why? Everybody should know the basics! Shape, approach and boundary defects, the major types of liberty shortages and simple fractions of an eye belong to the topics often distinguishing double from single digit kyus. A double digit kyu must acquire such knowledge to reach a single digit kyu's level of 'life and death' skill. Knowing how to invade, what basic strategic mistakes to avoid and how to perform tactical reading are topics for players to 5 kyu but double digit kyus face the same problems and so benefit from learning these topics earlier. The long chapter about capturing races plays a special role. Although its reading can be postponed, there is more to learn about the topic than in every other English book that does not specialise in capturing races; nevertheless, the theory is restricted to those basics applicable by double digit kyus. The same can be said about tactical reading. Although its chapter has an ordinary length, the answers in the problems part of the book explain the necessary decision-making of tactical reading for the most difficult problems. The second part of the book consists of seven chapters and 213 problems. Altogether the book has 274 problems, of which most are newly invented. Every chapter has its problems roughly sorted by increasing difficulty from 'very easy' for 20 to 10 kyus to 'single digit kyu level'. If all problems were for double digit kyus, they would have no guarantee to increase their current skill of solving life and death problems. The problems of intermediate level provide the reference of where the reader hits his current wall. Every chapter starts with presenting the techniques and concludes by exemplifying them once more. Hence the reader gets three chances to learn them. Furthermore, whenever necessary, the problems apply the theory of the first part of the book. The first six problem chapters discuss the most fundamental topics 'cut and connection', 'capture' and 'atari' as well as the second fundamental level about 'construction of an eye', 'partition of an eye' and 'size of the eyespace'. These are the topics double digit kyus must become familiar with. Beginners dismissing the basics as "too easy" get stuck at their current level of solving life and death. First they must acquire a firm understanding of the fundamentals. The grouping of the problems by topic eases learning. Needless to say, the chapters explain the techniques with details, such as threats, preventing the opponent from applying a technique, defense versus attack, expansion versus reduction and throw-in. Whilst the first six chapters only occasionally study groups of a few related problems with similar shapes, the seventh chapter has 11 groups of altogether 57 problems. A typical group of problems first studies relatively easier problems before proceeding to a more difficult problem requiring tactical reading that is one move deeper. Thereby the reader improves his iterative reading. Furthermore, the Mixed Problems chapter presumes knowledge of the previous chapters' techniques and combines their application. After cracking the nuts, this final chapter rewards the reader with a clear summary of the major types of problems from the point of view of tactical reading. Throughout the book, explanations are the more detailed the more demanding an aspect or the variations of a problem are. Almost all diagrams only show a few moves so that the reader can easily follow the sequences. First Life and Death raises a player's skill of solving life and death problems from beginner to intermediate level.